It’s Time D-Heads! 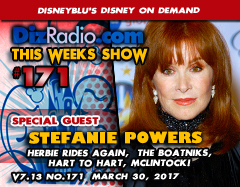 This week we talk from the heart and take that ride again as we welcome STEFANIE POWERS (Herbie Rides Again, The Boatniks, Hart to Hart, McLintock!) to the show! 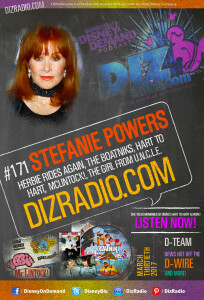 Stefanie stops in and discusses her longstanding career, favorite Disney moments, Herbie, being a Boatnik, the popularity of Hart to Hart, Wildlife Conservation and more! In addition no show is complete without the D-Team and you have the questions and Erin has the answers in I Want to Know. While Domenic let’s the dogs out as he brings you an all-new Disney’s Short Leash. We have Cody taking a stroll on the Hollywood Walk with more about Stefanie Powers. 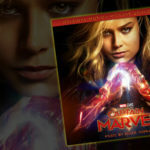 And Jason is here digging deep into The Vault with another Blu-Ray and DVD you have to add to your collection. And let’s not forget Randy with the latest on Disney’s Multi-Media. 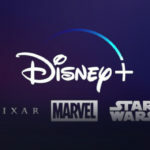 There is news fresh off the D-Wire with the latest news Kingdom Hearts, Square Enix, The Magic Kingdom, Walt Disney World, Star Wars, Bob Iger, The Walt Disney Company, Moana, Walt Disney Records, Tangled the Series, Disney Channel, Security at Walt Disney World, and more!